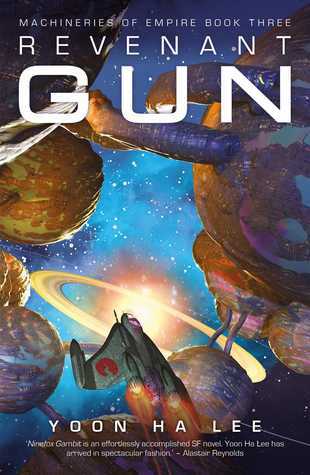 The Revenant Gun is the third and final entry in Yoon Ha Lee’s “Machineries of Empire” series. The first two books were imaginative work with cunningly crafted characters, desperately eldritch technologies, high stakes plot and some top-notch world building; to get it out of the way, this finale does not, in any of those categories, disappoint. The world…well, the world has changed. The Hexarchate, that sprawling empire, ruled by elite castes, with exotic technologies that persist based on calendrical observances, is over. Politically, what was once the Hexarchate is split – between those holding to the old calendar, their technologies powered by pain and torture of dissidents and heretics, and those who say that observance is now a matter of choice. The external factors are still there – other political entities which are either alien, or have different enough views to be considered so – creeping around the edges of the Hexarchate borders, looking for an excuse to pull chunks off it. This is what keeps the factions from all out war – but space is an imbroglio of barely suppressed tensions, one swift trigger pull away from devastation. There’s a lot of really clever social structures work here; the different castes – the militaristic Kel, constrained by their ingrained need to follow the orders of those above them, the fey Shuos, artists and intelligencers limited by their own need to scheme against each other…and all the others – feel distinct, and ever so slightly strange. They’re human enough to be sympathetic, with edges which feel strange and unfamiliar. That strangeness is backed by the exotic technologies which tie the galaxy together. There’s weapons which work in non-Euclidean space, with descriptions which hint that detail might drive the reader mad, the servitors – near human creatures whose society and culture is limited by the perception of those who see them and there’s the Moths, ships with internals which rearrange themselves dependent on who is inside, the ability to leap distances and some seriously terrifying firepower. It’s a strange, sharp edged, bloody world, once ensconced in systems which are often uncaring or broken. But it’s a fascinating universe, filled with the odd and the unknowable, a place where the liminal becomes the real, often painfully. It’s an often disturbing space, with a razor edge. But that’s counterbalanced by hope, in the form of its meticulously crafted characters. Jedao, who we’ve seen a lot of in one way or another, is probably the most obvious of these. Jedao is whip smart, ready with a swift analysis and a smart mouth, letting his intelligence run the game for him. But here he’s also damaged, unsure of himself, trying to anchor to a sense of identity in a swirling morass of contradictions, some of which might end lethally. The mind behind the eyes is always three steps ahead, but always struggling against a lack of understanding. In contrast to the older, more focused Jedao, this is an individual with a sense of optimism. Often thwarted, often backed by a sarcastic remark or the odd bout of gunfire, but this Jedao isn’t ground down. That said, he carries a certain amount of baggage, both clear and subtextual. There are meditations on authority and consent here, as in previous novels, as Jedao struggles with to square his personal feelings with duty, and both with larger concerns of ethics. His is a love story, of a sort – just one which delves into the more occluded corners of the soul, and is unflinching in its exploration of those. If those aren’t big enough issues, framed in personal relationships, there’s others. Brezan, for example, the Kel staffer-turned-general-turned-reluctant-revolutionary, shows his face again, trying to construct a political entity which will weather the storms of battle and time. I’ve always loved Brezan, for their combination of exhausted running-out-of-craps-to-give, and barely visible idealism. They’re determined to both look at the big picture and try to understand at least some of the minutiae, and are also smart enough to know that this may be impossible. Fortunately, they have Mikodez to help out; once a Hexarch one of the great powers in the universe, Mikodez now helps guide this universe toward a hopefully better future – but is rather fey about it. Clearly horrifiyingly intelligent, and a giver of small gifts to others, Mikodez’s backchat with other key players always makes me smile, and his emotional undercurrents in discussions with Brezan are enough to make one weep. There’s also a lot more time spent with Kujen, the arch-mastermind of the Hexarchate. Kujen is, to put it mildly, odd. They seem to have an affection for Jedao, but it slithers gently around the borders of the acceptable. They also seem capable of all sorts of atrocities to achieve their goals. But there are hints of a different person there, one not yet dragged through the hedges of life, one who made the wrong choices for the right reasons. In my reading – and it’s a mark of how impressive the prose is that yours may differ – Kujen is an old, old monster. But also an indicator that any of the characters could become such a thing, given time and motivations. The abyss has looked back into Kujen, and it’s possible that all that separates them from the other characters is time, and appalling decisions. It's a subtle book, one which approaches complex questions. There’s the politics of empire, to be sure. There’s an examination of authority, of love, and of trust and what that means. There’s love, and the different forms it takes. There’s duty, and what it drives us to do. There’s more time with the servitors, that minority group whose agenda is debatable, but whose segregation and marginalisation is not. All of this is wrapped in a story filled with laser fire, with pistols, ticking timers and bloodbaths. There’s some wonderfully esoteric space battles which also have all the immediacy of a punch in the face, and some emotionally fraught scenes which felt like I was being torn apart. It’s thoughtful, character driven sci-fi in a highly original, terrifying universe, with a plot that kept me turning pages until far too early in the morning. If you’re not reading the series yet, go and give Ninefox Gambit a try. If you’re all caught up, then yes, this is storming conclusion to an excellent sci-fi series. 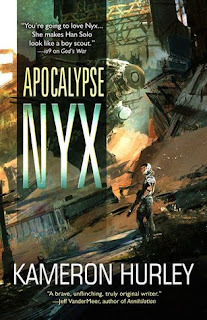 Apocalypse Nyx is a selection of short stories starring the titular Nyx. Once a member of the Bel Dames, a brutally effective group of government assassins. Nyx is now a bounty hunter – though she’s lost none of her skillset. Or her attitude, as she guides her team of bounty hunters through the vicissitudes of life on a world wracked by war and magic. Lets talk about that world for a minute. It’s one defined, at both the personal and macro levels, by conflict. Nyx’s nation has been waging war with one of its neighbours for what feels like generations. In pursuit of victory, they’ve used guns. Bombs. Espionage. Tailored viruses. Genetically engineered bugs. As have the enemy. All this has led to large portions of the country being uninhabitable. It’s also led to almost the entirety of the male population doing mandatory military service in fantastically lethal war zones, with a very low life expectancy. Socially, this is a world run by women, because all of the men are either fighting, or dead. Of course, the world is broken, which makes everything a bit more difficult. It’s a world of faith – one where the call to prayer goes out on schedule, and where mullah’s are in competition for the attentions of the faithful. But also one which encourages a loss of that faith, in tragedy, in pain, in loss. Then there’s the insects, and the magicians. The insects – well, they’re all over the place. This is a world which has embraced bio-mechanical and genetic engineering. Where the world as a whole is a tapestry of the waste of human potential, the sheer inventiveness here – of killer wasps, of spy-bugs which are actually, er…bugs, of ichor which can be used to build an arm – lets in a little creativity, a little humanity. Of course, that creativity is being used to create wasps big enough to be used as a swarm of guard dogs, but that’s Nyx’s home for you. There are these little sparks of ingenuity, of hope, of purpose, wrapped within an occluding sense that they’ve all been misused; that things are broken or decaying, systems and artefacts both, but only due to the hubris or neglect of people. It's a vividly drawn world, to be sure. In its hopes for and expectations of humanity, it carries a raw emotional punch. Watching Nyx drive past an abandoned homestead, shattered by bio-bombs, or see a family struggling to survive in a desolate, dangerous landscape, caring for a war veteran now catatonic from the experience – it’s a punch in the gut. It may make you feel pain, sadness, or a bubbling frustrated rage, but it will definitely make you feel something. What Nyx seems to feel, mostly, is a kind of quiet self-loathing, mixed with frustrated anger and pride. One of the ways this presents, both to her colleagues and to the reader, is by not taking any crap from anyone. Nyx is damaged, sure, but I don’t read her as broken. She’s aware – perhaps far too aware -of her flaws, digging into them, making a nest in her own refusal to engage, in a world which encourages that disengagement by, well, being terrible. Much of what we might see as emotional growth is in the subtext – as she cares for her team, whilst also being prepared, or indeed encouraging herself to abandon them. They, or she, are liabilities, failures and monsters with whom emotional connection can only end in disaster. Nyx constructs a wall around an emotional core, maybe out of fear, maybe out of awareness of her own lethal nature, maybe because she thinks she’s poison, or maybe because emotional vulnerability is so often met with cruelty. In between the drinks (and there are a lot of drinks), Nyx is smart, mad, bad, and dangerous to know. But she’s a complex character as well, not only an arse-kicking heroine, awesome as that is, but a complex individual, masking their thought and their hurt under something else. You may be here to watch Nyx shoot some fool in the face with a shotgun, before disarming his two mates, breaking their necks, wiring a building to explode and stealing a priceless artefact under covering sniper fire. And you will not be disappointed. But you may be here for the quieter, sadder Nyx, who sees a relationship with one of her team as dangerous, who isn’t able to reach out, who matches affection and connection with abuse and frustration. Both are equally real, equally true. I won’t get into the details of the stories in this collection, to avoid spoilers. But there’s a lot of great stuff here. There’s tense heists, to be sure. Then there’s comedy of errors, as Nyx’s team of badasses runs their own sense of competence up against reality. There’s moments that hint toward a larger agenda, and a lot of great background. If you’ve ever wondered how Nyx’s team got together, how they stayed together, then there are stories here to answer your questions. If you wanted to see more of the world, the bug bombs, the endless, society-breaking war, the glimpses of high technology wrapped in an enigma – there’s some of that, too. If you want to see Nyx and the gang kicking arse and taking names, painting the walls with blood, then drowning the memories in alcohol – this is one for you. It’s fast paced sci-fi action, absolutely. It’s got enough blood and guts to satiate and satisfy, yes. But it’s also a thoughtful collection, one which gets us further into the characters heads, one which isn’t afraid to get the reader thinking about the way pain and hurt can make us act, and isn’t afraid to explore larger issues. If you’re new to Nyx, this may be a good place to start, taking place before the current series of which she’s the star. If you’re already a fan, this adds some wonderfully bloody, emotionally sharp texture to an already intriguing world and characters – get on it. ‘Grey Sister’ is the sequel to Mark Lawrence’s acclaimed ‘Red Sister’, a book which I, for one, absolutely fell in love with. 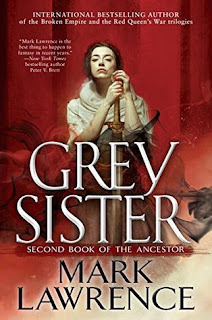 When I picked up Grey Sister, I did so with high expectations, and more than a little trepidation. Would it have the same precision and vivid worldbuilding of the original? Would the plot once again leave me turning pages late into the night (or early into the morning)? Would the characters be as weird, wonderful, and thoroughly human, with an emotional resonance that could equally crack a smile or wring out tears? The short answer, to save you some time, is yes. Grey Sister is a gem. Admittedly, it may be a gem found soaked in the blood of your enemies, but still. Part of the sparkle in that gem is Nona. After the events of Red Sister, Nona was inducted into the next class up – learning intrigue, perception, disguise and murder-by-stealth. It’s an opportunity to make new friends, but also, of course, to create a whole new set of exciting enemies. Nona still carries the same traits she had previously – she’s ferociously loyal to her friends, utterly heartbroken by betrayal, courageous, stubborn, and, at least initially, feels almost terminally straightforward. She’s never met a problem which she couldn’t punch in the face. Externally, Nona is absolutely fierce. She doesn’t have a shadow. Or irises. And she can probably break you in half with one hand behind her back. There’s an atmosphere of seething rage around her, and a sense that it’s held at bay entirely by willpower. Nona is emphatically not someone you want to mess around with. On the other hand, she carries a certain fragility – having almost built herself a personality by first principles, after childhood trauma, she looks for connection and warmth, for affection and loyalty, and mirrors those back in her friends. She can break an attacker into teeny tiny pieces, but the betrayal of a friend would be a cruel wound, and the emotional damage is far more problematic than the physical. This fragility, now masked somewhat, is backed by her relationships with friends and teachers. In this book, we do get to spend more time with Abbess Glass, the voice of the nunnery, and a woman who always seems to be twenty moves ahead of everyone else. Between cryptic plans, she appears invested in her nunnery, with pastoral care and tautly focused political advice running side-by-side with delightfully byzantine plots. Glass also serves as an occasional point-of-view character in the text, letting us have a broader socio-political understanding of events to run alongside Nona’s more limited (if more intense) perspective. There’s also the return of Nona’s gang of novices from the previous book. They’re a charming lot, and their banter and easy camaraderie really helps to ease the otherwise rather grim atmosphere. Then there’s Keot. Keot is – well, they say he’s a devil, but I’m not entirely sure what Keot is, and that’s alright. Practically, he’s a voice that lives in Nona’s head, a voice that urges her to rend, to kill, to strike back against an uncaring world with a boiling rage. Keot is not, it has to be said, very nice. Living inside Nona though, he has an interest in her safety – and so, somewhat begrudgingly, he helps her out from time to time, in between trying to get her to murder everyone. What struck me about this relationship, and why I mention it specifically, is that both Keot and Nona are broken, in different ways. Nona struggles with her rage, but Keot embodies his own. Nona has built a life, with friends and enemies – Keot seems to lack a past, being more of a superheated id, tuned for aggression. Still, his relationship with Nona is fascinating, two beings with a certain remoteness about them, thrown together, for better or worse. I wanted to know more about Keot – what he was, where he came from, how he fits into a world of magic alongside the Path – and seeing his jagged edges grind up against Nona’s fragile control was a marvel; their dynamic may not be healthy, but it’s close, taut and emotionally real – as well as absolutely riveting. Against this are, of course, some absolutely delightful villains. These range in scale from schoolyard bullies with a penchant for control and verbal cruelty, through to deadly assassins. In between their nefarious efforts, there’s a sense that a few are working on the same level as the Abbess, looking at the bigger picture and trying to arrange it so that they come out on top. Those with a more limited focus also tend to be those whom we see more intimately – their pride, their smug verbal poison, their knives hidden between social smiles. It’s marvellous, seeing the rotten heart behind a golden visage, the raw and repugnant humanity on display. All of this, of course, happens in a larger world. It’s a world enclosed in ice, where a thin strip of land encircling the globe keeps a population alive. It’s also a world where the ice creeps closer every year. This was alluded to in the previous book, but it’s more pronounced here. As the ice grinds unstoppably forward, cities are crushed beneath it. Farmland is lost. Resources decline. War comes ever closer, and it seems we’re at a tipping point. Alongside the murmurs of conflict, of encroaching ice, there are quieter facets of the world being explored. There’s the devils, like Keot – though who they are and what they want, even they may not be entirely sure of. There’s the Path, access to which seems to provide powers from the merely impressive to the downright superhuman – though always at a cost. There are mysterious devices, which flit between the mystical and the technological. There are hints of what came before, how the people on this world came to be there, and the price they paid to do so. It’s often in subtext, or in throwaway remarks, but there’s hints of so much history here, giving a sense not just of a world which is lived in, but one which has been lived in, broken, fixed and broken again, for a very long time. This is a world of legions, of duels and hard-faced politics. But it’s also one of magic, of twisting the strands of fate, of moving faster than the knives coming to gut you. Mostly though, it’s one where people live, a rich tapestry of joy and sorrow which, frankly, I can’t get enough of. As a setting, it’s vividly vital, and full of secrets to unearth. The plot…well, as ever, no spoilers. Part of it is about Nona’s efforts to work through Grey class, and there are some marvellous magic-assassin-school shenanigans. Some beautifully constructed prose keeps the whole thing rolling along, school antics gaining the same kind of tension and gravitas usually reserved for a high-stakes heist. The internal ructions of the nunnery were a cracking read in Red Sister, and that quality persists here, as Nona drives herself forward, a stubbornly thrown rock in the tide of everyone else’s expectations. The wider world intrudes as well, and leave hard choices being made. There are betrayals, there’s blood and fire. There’s a young woman trying to work out who she is, and what she wants, while also kicking arse. There’s high politics, and some marvellously taut scheming. There’s secrets revealed, and struggles against repugnant villainy. Most of all, there’s a deep emotional resonance to Nona’s journey; as she struggles, so do we- there were moments where the prose seemed to reach out and tear holes in my heart, and parts where I was left shouting “Yes! Brilliant!” in an empty room. This book has sharp edges, and it will cut you if it can; and that emotional depth is what kept me turning the pages deep into the night (or early morning! ), and it’s what makes me recommend it without reserve. Grey Sister has real heart; its prose is compelling, the plot gripping. The characters are real, in all their bloody, broken glory. My expectations were high, and they were surpassed; it’s an absolutely storming sequel. Once you’ve finished Red Sister, this should be the very next book on your list. In short, Empire of Silence is about a beginning, and about a boy becoming a man - the beginnings of a life of Hadrian Marlowe. Sun-killer. Hero. Villain. Collossus of his age. In this instance, however, a callow boy with a penchant for smart remarks and the ability to fall directly from the frying pan into the fire. Marlowe lives in the Empire, a galaxy-spanning entity whose organisation holds more than a shade of the Roman Empire. Mostly-hereditary aristocracies, with gene complexes which keep them alive for centuries, rule over planets of serfs, their power counterbalanced by that of the Chantry, a religious organisation with a hostile attitude to other creeds and other species, and a tight hold over the exercise of most advanced technology. In this sprawling cultural hegemony of a thousand terraformed worlds, Marlowe is the scion of a minor aristocratic family, albeit one with connections. He's smart, and dreams of exploring the universe outside of the known; but a sense of fairness and compassion sits uncomfortably with the sort of ruthlessness one needs to rule, or to kill. Things rather quickly go wrong, and we get to see what sort of man Had will become, as he rises from the ashes of his disappointments. He's an engaging character, to be sure, with an acidic sense of self-awareness which refuses to skip over his mistakes or failures, even the bloody ones. If things don't always go his way, Hadrian's efforts to be a better person are always on point, and empathising with his struggles against a family and a system which seeks to trap him in place, is easy. The prose which apparently rolls off his pen is a precision instrument - by turns humorous, razor-cut incisive, and thoughtful. There's some examination of what makes the nature of a man, digressions on Marcus Aurelius sandwiched between bloodied blades and baffling aliens. Hadrian is backed on his journey by an ensemble cast; it’s them I’d like to see more of. We’re restricted to one view, by virtue of seeing through Hadrian’s eyes, but where Hadrian is complex, his views of others seem less so. His father is a ruthless tyrant, his brother, broadly, drawn to action, to violence. Quirks of compassion there hint at something more, and it’s something I’d like to see. His mother carries a certain subtlety in her, in motivations for helping and hurting, and if they’re implicit, they nonetheless give her a lioness roar in her appearances on the page. The companions Hadrian acquires on his journey, by contrast, don’t reveal enough of themselves, of their raw emotional state, to really come alive. There’s enough there to give them a spark, to make them believable foils for Hadrian and his escapades – but I would have loved to see more; that said, the book is hefty as it is. The world-building is top-class. It owes a lot to classical structures, to be sure, but incorporates them into a more futuristic structure. What results is a galactic system of government, a vast, ungovernable extra-solar bureaucracy, with its own religion, social mores and expectations. There’s a sense of events happening, not only in the fictional history, but off to one side of the main thrust of the narrative as well. It’s a living, breathing space – one that comes alive as the reader turns the pages. It may not be the nicest place one might visit, but the grit and grime, the authority, the abuse, the sparks of compassion all speak to the vivid humanity on display. This is a biography, nominally, the plot the story of Hadrian's rise (or fall, depending on how you look at it). But there's a lot going on in here. Friendships between social castes. Arena bouts to the death. Political struggles between government and church. Duels between men and monsters. Or possibly monsters and other monsters - it's hard to say. This is a book filled with grandeur and blood, binding the fate of empires into the struggle for one man's soul, as he tries to work out who he is, and what he wants. 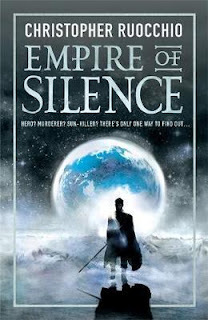 All of this is a polite way of saying I really enjoyed Empire Of Silence; it's a sprawling epic, with the lens of one perspective to keep it focused; there's legions, there's cryptic xenoarchaeology, there's discussion of opression and systems which define and break the people within them. There's swords, and knights, and carnivorous aliens. Starships and romance, of a sort, ruminations on power and blood on knives; it's great fun, and I'm looking forward to hearing more from Hadrian Marlowe's adventures.